Houses within walking distance of a Wetherspoons sell for 27% less than the local average. We’ve all heard of the Waitrose Effect, which sees property near one of the up-market stores boosted by as much as £36,000 – with this in mind, Mojo Mortgages wondered if there’s any other similar effects that exist in the housing world. They compared the prices of houses sold in the last 12 months within walking distance of a Wetherspoon pub to the average in their area. Their research found that houses within walking distance of a Wetherspoons were 27% (over £70,000) cheaper than the local average. The effect could be seen in 86% of 184 locations they studied. What’s more, houses sold near a Wetherspoons were 50% cheaper than the local average in 28 areas. The areas where houses near Wetherspoons are cheapest in comparison to the local average are all in the North of England. 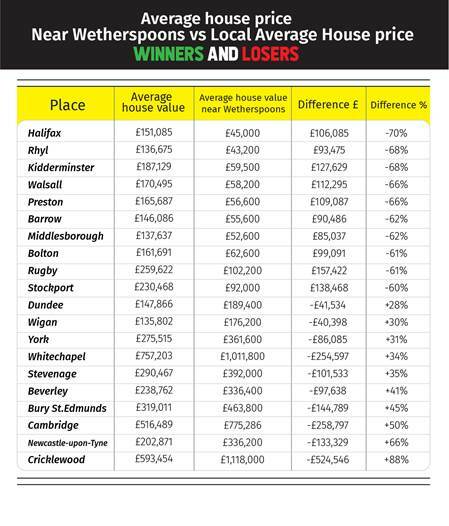 In Halifax, the price of houses near Wetherspoons were 70% cheaper than the local average, while in Rhyl, Kidderminster, Walsall and Barrow, houses were all more than 65% cheaper than the average house price in their area. In 24 locations from othe sample, houses near one of the pubs were more expensive than the local average. Many of these locations include affluent inner-city areas, such as Cambridge, Windsor, Edinburgh, and unsurprisingly, many areas of London. In Cricklewood, North London, houses near the The Beaten Docket Wetherspoons were 88% more expensive than the local average of £593,454. Following Cricklewood, were Newcastle and Cambridge, where prices were 66% and 50% more than the local average. Similarly, when looking at the cheapest places to live near a Wetherspoons, both Rhyl and Halifax have an average price of less than £50,000. 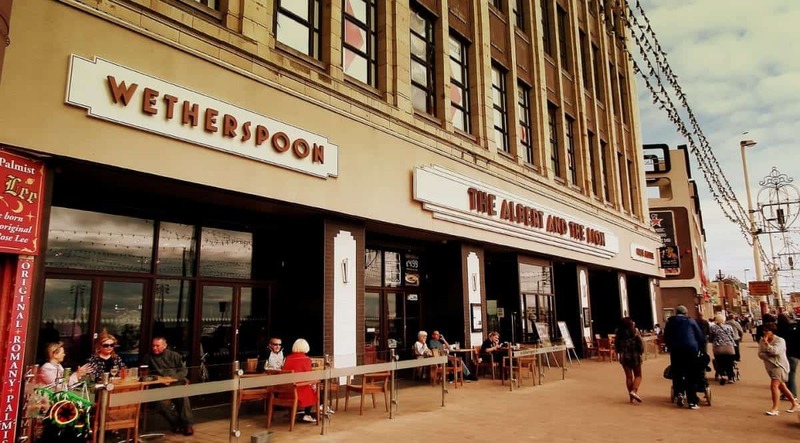 Overall, in 38 locations, the average price for houses near a Wetherspoons are less than £100,000. In contrast, the 15 most expensive places to live near a Wetherspoons are all in the home counties, with the top 8 in central London. The most expensive area within walking distance of a Wetherspoons is Holborn with the average house value coming in at £1.6 million, followed by Leicester Square, Cricklewood, Hammersmith and Whitechapel, with the average house price in all four areas all in excess of £1million.